According to the Mental Health Commission of Canada, it has to be more than just a consideration – awards for mental injury at work have dramatically increased in recent years. A 2008 paper issued by the Commission suggested awards had increased by 700 per cent in the preceding five years. Just as employers have an obligation to maintain a physically safe environment, they also have a legal duty to provide a psychologically safe workplace. Employers in consultation with Joint Health and Safety Committees should focus their attention on controlling these work related psychosocial hazards to prevent burnout, mental illness and the physical harm caused by excess work related stress. Arbitrators are holding employers responsible for causing harm to employees that is reasonably foreseeable, even when there is no specific language that addresses these issues in the collective agreement. Health care employers must be proactive in mitigating the impact of restraint on their staff if they don’t want their actions to be counterproductive. For many, that begins with showing some basic respect for both the professional and support staff. If there are serious morale problems in the workplace, likely incidences of depression and anxiety are on the rise. That includes involving staff in addressing issues in the workplace. Hospitals already have a mechanism called the Fiscal Advisory Committee for gathering input on budgetary issues, usually the crucible for change. We have been told of CEOs walking into the FAC committee, throwing down the budget, and leaving. Others have fought against even having union members on this committee. Some senior administrators have made their own staff the enemy refusing to involve them at all in the change process. Others complain bitterly about arbitration decisions and threaten unspecified layoffs. Both instances raise stress levels further. Health care employers could also do much more within their own work environments, listening to staff and providing support when needed. 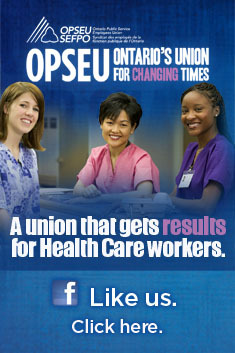 Not only must we challenge austerity, union members must look at how we can support each other during difficult times. The Canadian Mental Health Association stresses the importance of having a support network. Isn’t that the essence of the labour movement? With stress on the rise, recent legislative changes make it mandatory for our employers to have plans in place to prevent workplace violence, including workplace risk assessments. These plans must be in place by now. An employee struggling to cope may be in need of accommodation. Instead of accusing someone on accommodation of getting special treatment, it is far healthier that we should all be discussing how the workplace environment could accommodate everyone’s needs. In the coming months health care employers are going to be severely challenged by the outcome of the provincial budget, to be delivered March 27th. How they respond could tip the balance on how their workplace functions. This entry was posted in Mental Health and tagged Bill 168, Canadian Mental Health Association, Joint Health And Safety Committees, Mental health and the workplace, Mental Health Commission Of Canada. Bookmark the permalink. If chronic workplace related mental health injuries were compensated by the WSIB (as physical injuries caused or aggrevated by work are) then we might see more action on prevention. That they are not is a cruel injustice. Too often the focus is on trying to “assist” workers to “cope” with psychologically harmful working conditions than in improving those conditions and preventing harm.